Homeowners Bubba and Mariana V ann with Gallery Built Homes have designed a casually elegant kitchen with a mix of contemporary and farmhouse style. The bar area is meant to be opened up during parties to add an element of sparkle. Nestled in a crook of the bend on the Lower Laguna Madre is a quaint gated subdivision most people would agree is the best little hidden piece of real estate in Texas. There’s no better way to admire nature from within your home than to look at it through a massive picture window. When you have access to a million dollar view, the last thing you want to do is to obscure it. Our feature home was designed to take advantage of the view by Mariana Vann, wife of Gallery Built Homes owner Bubba Vann. For her own dream home, she convinced Bubba to depart from the Mediterranean style he prefers to build. While the facade of the home has features reminiscent of that style, such as multiple elevations, ceiling beams, low-pitched roofs, and stucco walls, the similarity ends there. This exterior is all straight edges and angles, giving it the clean lines of contemporary architecture. Once you step through the front door, you are instantly grabbed by the view of the Laguna Madre and the barrier reef. The home was designed to maximize the view of South Padre Island, especially the night lights. In the living area, the Vanns installed a set of three tall vertical picture windows, adjacent to one another, to create a wide view in the living room. Invigorated by the beautiful view, I then turned my attention to my immediate surroundings. In the living room, twenty-six-foot ceilings, with a clerestory and a second-floor-balcony create a sense of expansive space. Most home designers use only ninety-degree angles on all corners inside and out. In this interior, standard right angles are mixed with unexpected acute and obtuse angles, creating visual interest. 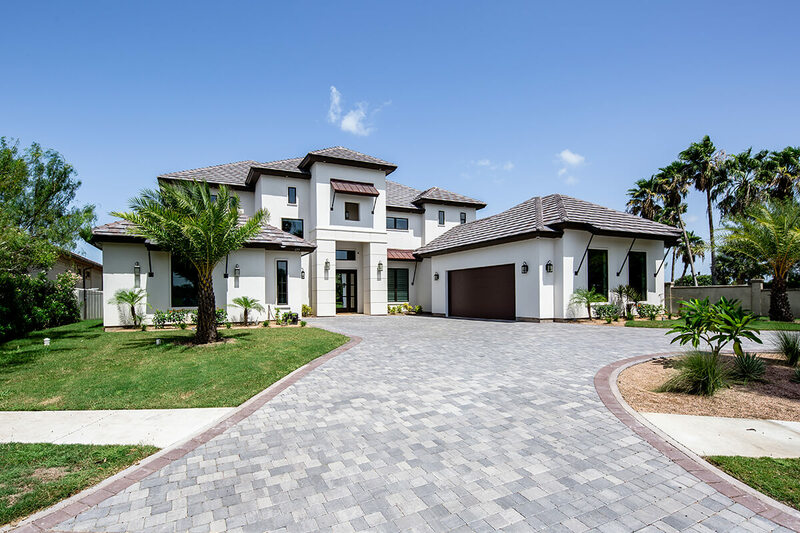 The contemporary architecture of this stunning home is accentuated by slate colored roof tiles and white stucco finish supplied by ABC Supply in Harlingen, TX. The neutral color palette has been deliberately chosen to avoid competing with the focal point, the lagoon. The primary color is light beige, with only slight variations in tone. Off white walls, gray and beige wood look ceramic tiles and a large sectional sofa covered in a light beige linen create an overall appearance of lightness and neutrality. Accents of silver and navy are used sparingly. In keeping with their minimalist approach, furniture and decorations from around the globe have been added sparingly. Wood and other organic materials are juxtaposed against metal and hard manmade objects. For example, there is a six-foot tall coconut tree that has been carved into a vase. A section from an Indonesian tamarind tree serves as a side table. To fit this home, its sides were painted silver. Two coffee tables with chrome bases and concrete tops are imports from India. There is coral from Tulum, Mexico, and rustic wood is paired with shiny mirrors. 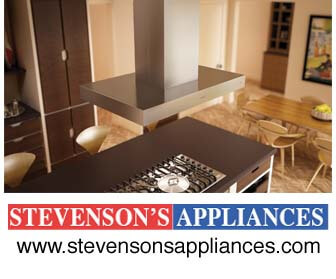 Cook like a professional with this commercial-style range supplied by Stevenson’s Appliances in Brownsville, TX. 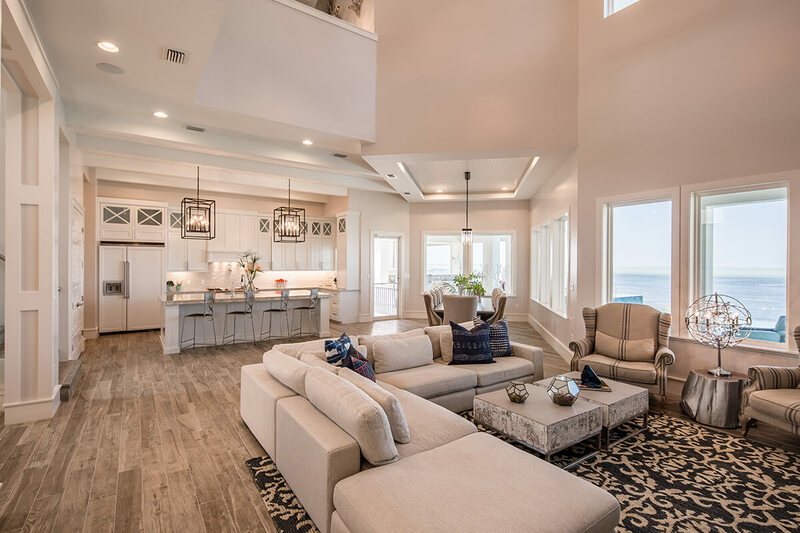 In order to fully facilitate the view of South Padre Island, the exterior wall facing the lagoon, in the dining area, has been set at about a twenty-degree angle facing the city. 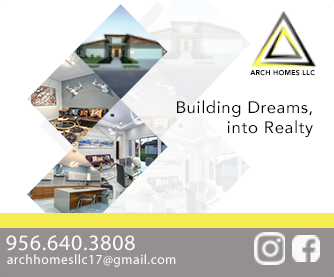 The dining table is positioned parallel to the angled wall in order to have a direct view of the city while dining and working in the kitchen. Exotic furnishings and decor add subtle textures that create a cozy tropical feel and were all “found” by Tropical Home Furnishings. Even though the dining room and kitchen are directly under the second story of the house, the ceilings are still about sixteen feet tall. The dining table sits under a perfectly delineated rectangular ceiling. It has a lighted rectangular fringed crystal chandelier adds a bit of bling over the rustic trestle style table and tufted upholstery wingback chairs. All of the design elements in this home are so cohesive that you may not immediately realize that this house also speaks farmhouse. 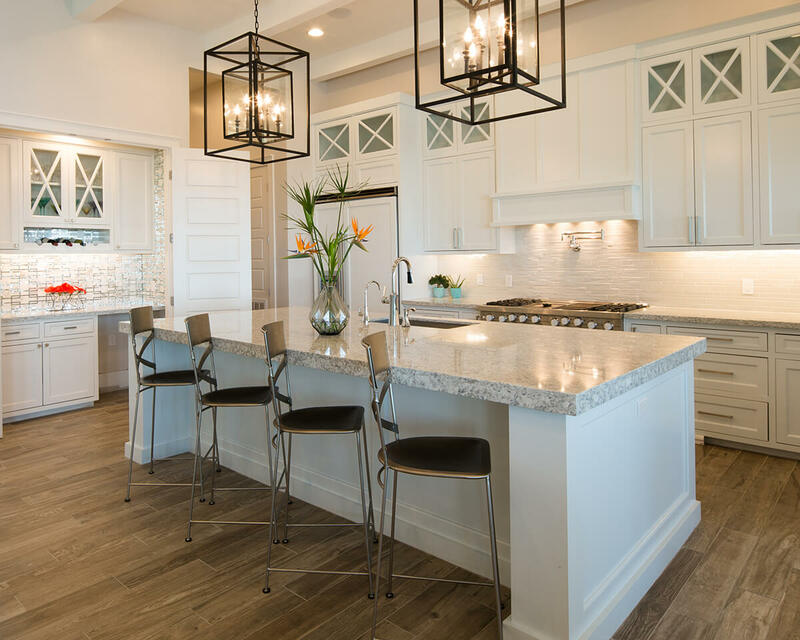 The large carriage house style chandeliers hanging over the kitchen island, the six-panel doors, the crossbuck design on the glass in the cabinets add a homey feel. All the kitchen cabinets are Shaker style. Shaker design originated from a religious movement that began in the 1770s during the American colonial era. This style favors an unornamented functional aesthetic that lends itself well to contemporary designs. Trademark characteristics of Shaker cabinets include flat paneled doors with rail frames. Bubba extended the Shaker style into the hallway and engineered unique casings for the doors and baseboards. The kitchen repeats the light color palette and appliances are barely visible. The refrigerator is covered with cabinet panels and the large stove is white. 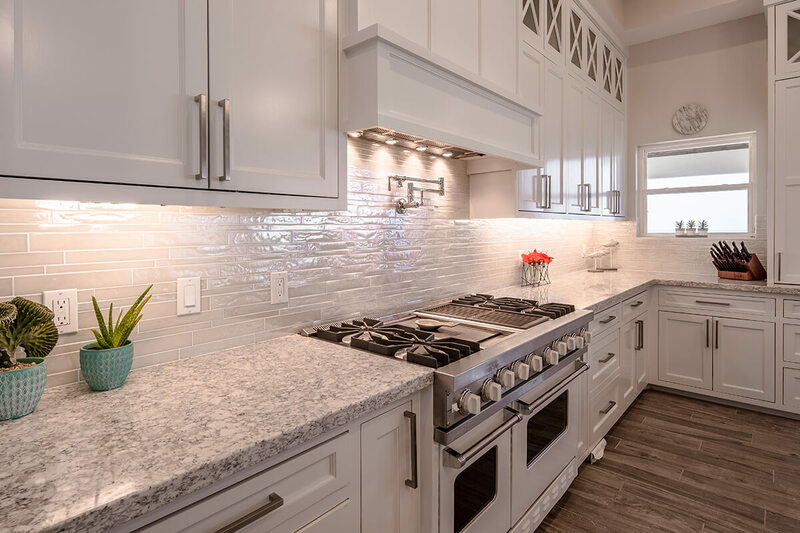 A textured white ceramic backsplash and quartz countertops with flecks of white, gray and beige complete the look. It requires two flights of stairs to reach the second story. Light washes over the staircase through the glass balustrade. The treads on the stairways and landing are all clad in the same tile that covers the floor. Two windows on the exterior wall at the landing flood the stairwell with light. Overall, it has a stark minimalist look. A six light black orb chandelier with a cut ball crystal dangle adds a touch of the organic to the architecture. At the top of the staircase, a larger second landing acts as an anteroom for the master suite, and as a secondary private sitting area. It’s a very cozy spot, with a built-in cabinet with storage and shelving for decorative items and a large screen television. Natural objects like coral are contrasted with metallic items that reference nature. 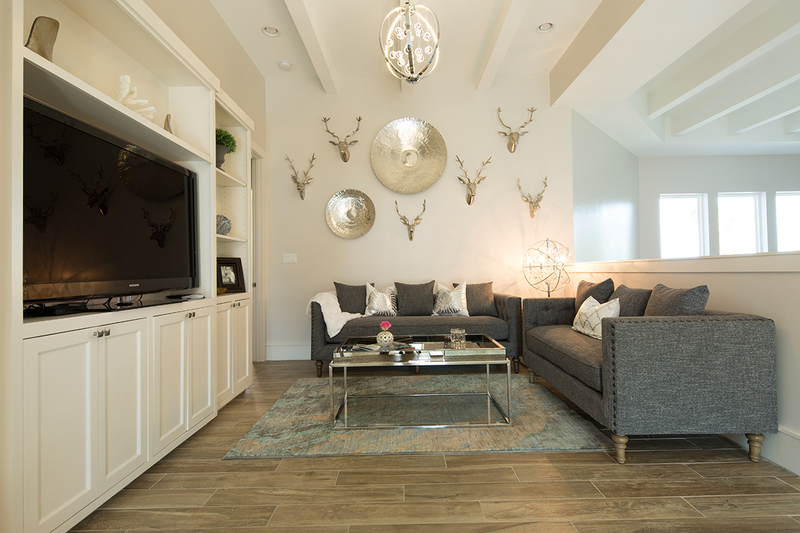 Several aluminum deer heads and two steel sunray sculptures adorn the wall above the sofa. The sitting area has a half wall. A corridor leads to the children’s rooms and a private television room for sports enthusiasts. I experienced a moment of vertigo when I first stepped into the corridor because the walkway has the same glass balustrade as the staircase. 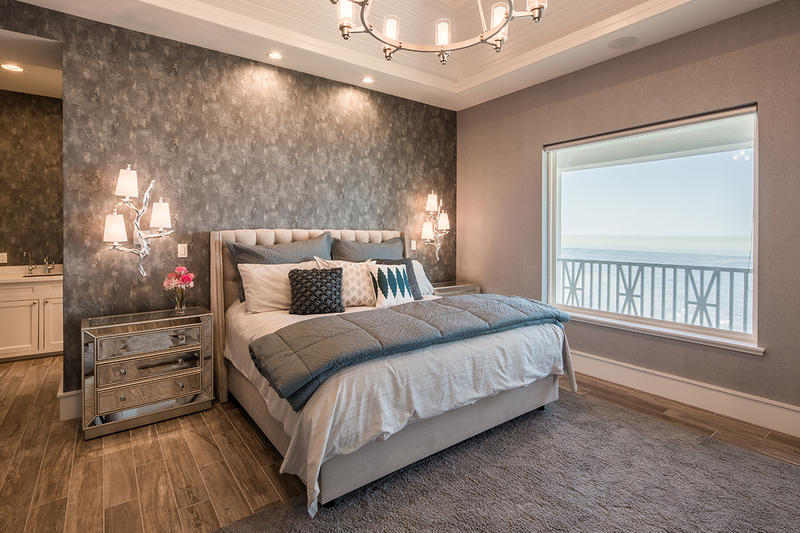 The splashy contemporary variegated wallpaper is also supplied by Rodriguez Home Center. 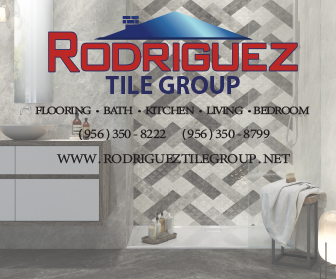 A cohesive look is maintained throughout the home with beautiful wood-look ceramic tile floors provided by Rodriguez Home Center. Coffee’s just at hand at the bar in the master suite. 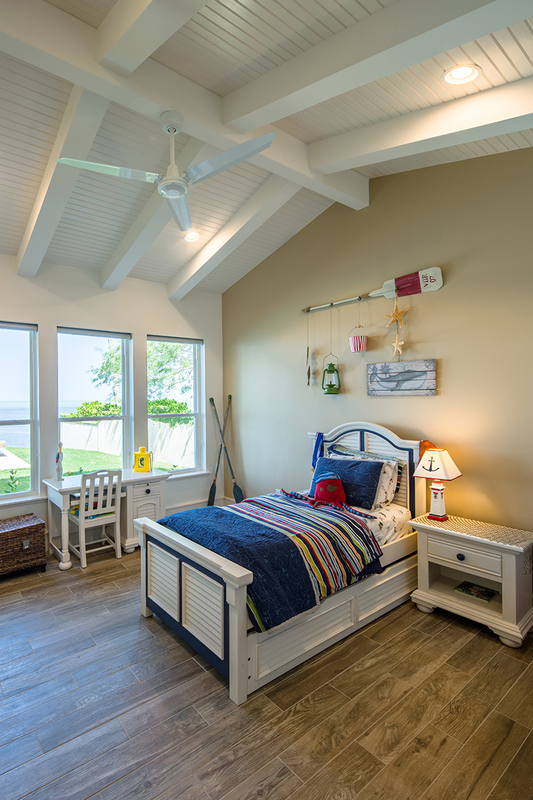 The bedroom proper has minimal furnishings: a large bed, mirrored three drawer bedside chests, a mirrored console, and two lounge chairs. The nailhead design on the nightstands repeat the nailhead trim on the headboard. There’s really no need for large chests and bureaus in master bedrooms anymore. The master closet takes their place. A luxurious spa style bathroom is on everyone’s wish list today, and the master bath ticks all the boxes. White marble with gray veining covers the floor and large shower. There are two vanity areas and a beautiful freestanding oval bathtub. You would probably expect that any newly built luxury home will be “smart.” This one probably has an IQ of over 140. 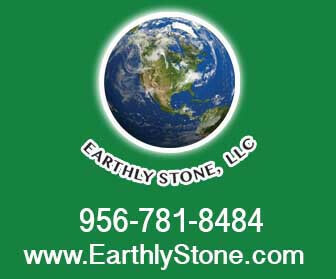 For those who aren’t up to speed, a ”Smart Home” is the term commonly used to define a residence that has appliances, lighting, heating, air conditioning, TVs, computers, entertainment audio & video systems, security, and camera systems that are capable of communicating with one another and can be controlled remotely by a time schedule, from any room in the home, as well as remotely from any location in the world by internet. Today’s luxury homes place a huge emphasis on entertaining, particularly outdoors. This home’s outdoor kitchen is a grill master’s dream with a traditional grill and a smoker. There’s a counter with a sink for prep and a large island for serving and eating. The island was made from a solid piece of granite that is a showstopper. When I gazed down at the surface, I was mesmerized. It was like peering into a tidal pool. The interior color palette is repeated outside, with sand colored unpolished travertine tile flooring that complements the granite. However, the cool blue of the infinity edge pool and the sparkling multi-colored iridescent tile on the spa surround definitely make a vibrant color statement. Decorative elements around the pool’s perimeter include an enormous man-eating clam, a large pot dredged up from the sea bottom, and a 250-year-old trough from India. This home design proves that you don’t have to live in a rustic farmhouse to experience the warmth and coziness of a traditional family home. Two styles have been deftly integrated to produce a contemporary bayside paradise. Looking for a New Garden Home? 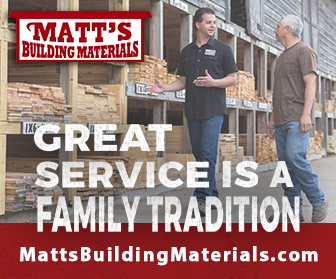 Building Homes of the Future TODAY! 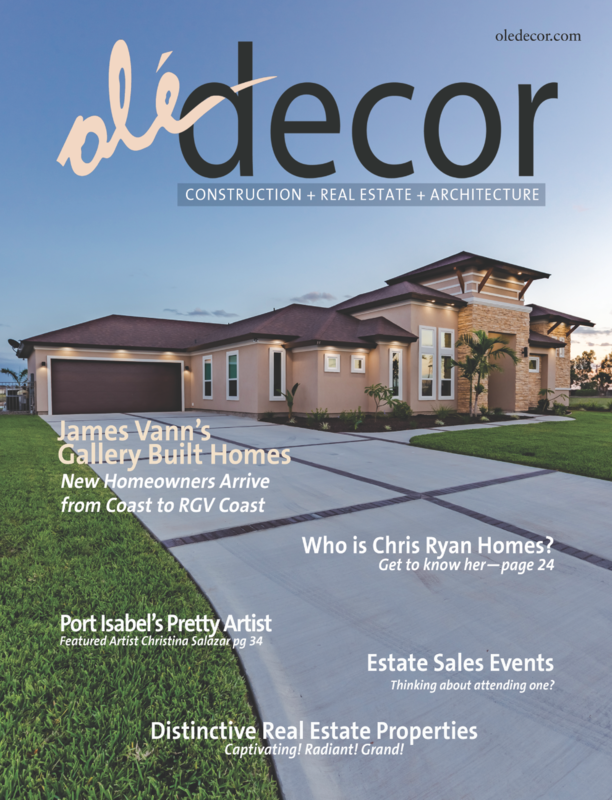 RGVBA Builder of the Year!